A seemingly disconnected Boston Celtics team were on the road in Philadelphia to face the surging Sixers on Tuesday night. Despite not having Kyrie Irving and Aron Baynes, the Celts gave Philly a great fight all game long before ultimately capturing the narrow victory, 112-109. 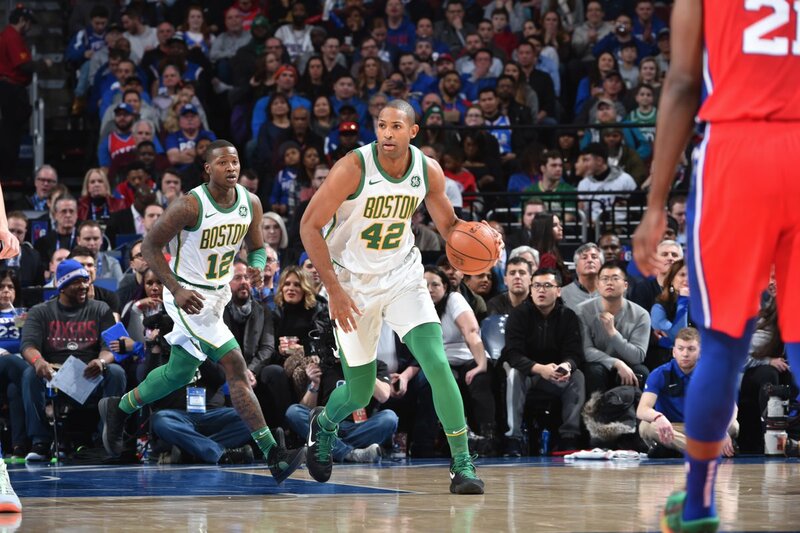 The veteran duo of Al Horford (23pt/8reb/5ast/4stl) and Gordon Hayward (26pts) each played one of their best games of the season to lead the shorthanded Celtics to a big win against the new-look Sixers lineup. The C's came out strong to start the night. They looked solid on both ends of the floor and an early Horford tech showed some fire from a Celtics team that has recently been criticized for their lack of heart. The Celtics played very solid defense on the Sixers talented, new-look starting five. They made almost every shot a difficult one, shutting down Tobias Harris, JJ Redick, and Ben Simmons in the process (ok, that last one's not so hard to do). The Sixers have been averaging 130 points per game since trading for Harris, but the Celts held them to just 23 points in the quarter. Boston's second unit brought a shooting spark off the bench later in the quarter. They hit three straight trey balls in three possessions - two from Hayward and one from Daniel Theis. They shot 48% as a team in Q1 and their defense gave them a five-point edge after 12 minutes. The hot hand transferred from the road team to the home team early in the second frame. The Sixers started knocking down their looks - many of which from three, to further reduce their small deficit and momentarily take a lead. Many of this scoring was from backup guard T.J. McConnell, who scored seven points on 3/4 shooting. Horford had a fantastic all-around half of play, proving his worth as a max player on Danny Ainge's roster. The 32-year-old shadowed Joel Embiid defensively, holding the All-Star to eight points on 3/9 shooting. Embiid is one of the best players at getting to the free-throw line, but only did so three times in the half. Big Al also grabbed a pair of steals. Led by the big man, the Celtics used a late 8-0 run to finally find some 2Q offense and rebuild their lead. Once again, Philly was held to a mere 23 points in the quarter. Boston's third-quarter woes arrived in a hurry after the intermission. And I mean A HURRY. The 76ers opened the 3Q with a 9-0 run and buckets from four different starters. This gave Philly a three-point advantage - their biggest of the night - and forced Brad Stevens to take an early timeout. Simmons and Reddick powered a rejuvenated Sixers offensive attack with their complimentary playstyles. Simmons was on the attack, penetrating Bostons defense and making the right plays - he scored three buckets in the paint and assisted on a pair of Reddick threes. Soon after this dunk, while trailing by eight, the Celts went on an 11-2 run to recapture the lead. Hayward looked like a completely different player all throughout this game, and went on to score nine points in the 3Q alone. Still, the Sixers' early run was enough to win the quarter, as Boston's halftime lead was cut from six to three. For the Sixers, Embiid finally started to heat up. The big man knocked down a few treys and scored eight points in the quarter. Luckily for the Celtics, Hayward stayed hot and knocked down some nice jumpers. The Achilles heel for the Celtics might have been their poor shot selections. And when I say this, I mostly mean letting Marcus Smart chuck up three treys in a short period of time - shots which he missed badly. He shot 2/13 from the field and 0/8 from three on the night. With three minutes remaining and a six-point Celtics lead, Embiid and Simmons singlehandedly powered a 7-0 run to go up 103-102. But once again, it was Hayward who had the response for Boston, knocking down a corner three to put the good guys back up. After a Jimmy Butler and-one bucket that cut the Boston lead to one, the Sixers sent the star of the night Al Horford to the charity stripe. The big man hadn't missed a field goal since November, and he wasn't going to miss under the bright light either, making both FTs. A few lockdown defensive posessions and two Tatum free-throws later, and the Celtics had the hard-fought win in the bag.